Proposed Legal Workforce Act would require E-Verify use by all U.S. employers. On September 8, 2017, U.S. Congressman Lamar Smith of Texas introduced the “Legal Workforce Act,” H.R. 3711. The proposed Legal Workforce Act would require all U.S. employers to use an employment eligibility verification system patterned after the E-Verify system, operated by U.S. Citizenship and Immigration Services (“USCIS”), to confirm the work eligibility of all new hires. The proposed legislation would effectively outlaw any U.S. business from hiring illegal immigrants. E-Verify is an Internet-based system that compares information from an employee’s Form I-9 to data from U.S. Department of Homeland Security and Social Security Administration records to confirm employment eligibility. In 1996, Congressman Smith, along with other members of the House of Representatives Judiciary Committee, introduced the bill that piloted the E-Verify system. Under current federal regulation, the use of the E-Verify system is completely voluntary except for federal contractor or subcontractor employers, as the federal government has a policy of only doing business with contractors employing a legal workforce, with few exceptions. Currently, over 700,000 employers use the E-Verify system to confirm employee workforce eligibility. According to the USCIS operated website, the E-Verify service has high user satisfaction and is completely free to enrolled users. The Act would repeal the I-9 paper system, replacing it with a completely electronic work eligibility check. Upon enactment, mandatory participation would be phased-in over a two-year period, timing of which would be conditioned on an employer’s total number of employees. In addition to mandatory verification, the bill also allows for voluntary use of E-Verify to confirm eligibility of employers’ current employees. The Act would preempt all state laws requiring or regulating use of E-Verify, but states would be incentivized to enforce federal requirements. The Act would create a safe harbor for employers from prosecution if they use the E-Verify program in good faith, and through no fault of their own, receive an incorrect eligibility conformation. The Act would increase penalties and fines for employers who knowingly hire illegal immigrants. In addition, the Act would create penalties for employer and employees who knowingly submit false information to the E-Verify system. 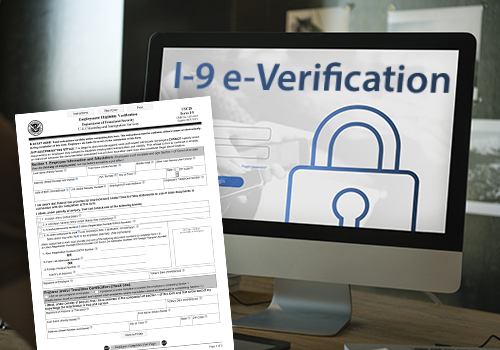 While use of E-Verify would remain free under the Legal Workforce Act, the cost of changing or updating systems regarding hiring and I-9 information would be borne by employers, and the cost of E-Verify operations would be borne by taxpayers. Since introduction, the American Civil Liberties Union has opposed the proposed Act because the program “threatens privacy and security, opens the door to employer discrimination and abuse, and is riddled with errors that could delay individuals’ ability to work.” To date, the House Judiciary Committee has approved the bill; it has yet to be voted on by the House of Representatives. The proposed Legal Workforce Act does not yet alter current U.S. employer obligations. Unless the employer holds a qualifying contract or subcontract with the federal government, use of the E-Verify system is still completely voluntary under federal law. Employers should, however, continue to monitor the proposed bill in order to plan and mandate new policies accordingly. Although E-Verify is voluntary under federal law, several states have laws mirroring or tailoring E-Verify requirements pertaining to state contractors and subcontractors. Employers holding qualifying contracts with the following states are required to use the federal E-Verify system: Alabama, Arizona, Colorado, Florida, Idaho, Indiana, Louisiana, Michigan, Minnesota, Mississippi, Missouri, Nebraska, North Carolina, Oklahoma, Pennsylvania, South Carolina, Texas, Utah, and Virginia. Note that California has banned the state or municipalities from mandating E-Verify use as a condition of a government contract or preserving a business license, and Illinois has limited E-Verify use by employers. In addition to state contractor mandated E-Verify compliance, the following states also require private employers to use E-Verify: Alabama, Arizona, Georgia, Mississippi, Missouri (if applying for a tax credit, tax abatement, or state loan), North Carolina, South Carolina, Tennessee, and Utah. Employers should seek counsel if unsure of compliance under state laws.